One must be prepared for these answers when one asks a devout Elder Scrolls Online fan what he or she wants added most to the game next. My personal notebook contains these too. But on the pages behind are a number of relatively modest features I would dearly love to see added to the game under ZOS’s “quality of life” initiatives. After Quakecon and the recent Imperial City announcements failed to mention any of them I thought it was take to embark on my quest to make the game’s developers aware of some rarely mentioned ideas. Let's start with three for my favourite angle: lore. There are thousands of books in ESO and the wider Elder Scrolls universe, but how many have most fans had time to read? I like the idea of ZOS extending its “fully-voiced game” to its lorebooks, or at least its most important. With so much time easily spent wandering Tamriel, traversing the depths of Stonefalls and the peaks of Skyrim, it feels like a great boon to be able to absorb more lore in the process. The Mages Guild skill line is advanced by collecting certain special books throughout the game, but reading them is not mandatory. I think given the attention paid to enriching TESO’s universe through word, more lore fans like myself would relish the chance to explore a character skill line through ITAL reading (or listening to) skill books. This is fairly obvious but the ability to have a hireling bring new or unread books to us, perhaps being the “reader” noted above, would be worth a skill point spend or two. A card-based TESO app was revealed at E3 this year but there’s a huge opportunity for ZOS to keep gamers connected to their world with a mobile app. As a perk to having a ESO Plus subscription why not let us check in on research, be alerted when work is completed, and search and trade within guild stores. By extension, the app could keep us connected to our guild chat and make P2P trade more successful. I’d even go as far as to suggest the group finding tool could benefit from an alert system. Uber rewards drivers for getting to work when demand for taxis exceeds capacity — why not reward players for switching their machines on and joining quests when demand is similarly high? Too many times I’ve been in conversation with an NPC and the response to my dialogue resulted in shocked face, wide eyes and hands outstretched as if to say “oh no!” It bugs me that so many NPC actions and animations are now, after over a year of play, feeling deeply repetitive. I’d like some new ones please! Easy one this: why can we craft armour, forge golden swords and reset our entire roster of abilities and attributes … and yet we’re stuck with one hairstyle? 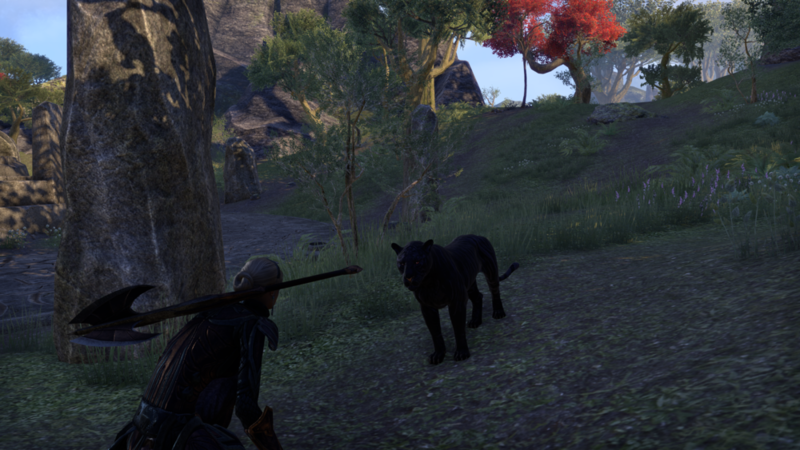 I have an expensive black panther accompanying me around Tamriel. But, if I’m honest, he’s as much use as mage in a swordfight. Less so, probably. Why can’t he alert me when I’m near a chest, or wild provisioning item, or getting close to a quest-giver? Why can’t I use him to divert an enemy mob or curious city guard away from me during sneaky moments of pickpocketing? I think we should be able to train our pets as we do mounts, making them more useful at tasks other than lowering our Crown balance. The beauty of ESO’s in-game items, such as swords and armour, right down to looted items, stolen goods and materials, are rarely in question. But I wish we could look at them a little more closely. I often feel I lack a connection to the armour I craft when I can’t see the result in first-person view from all angles. If nothing else it’d be nice to be able to see items a little closer from the menu. I’ve turned comments on below. Let me know what small features like the above you’d like to see ZOS add.